Everest comfort trek follows the footsteps of Edmund Hillary and Tenzing shrepa and ends with an ascent of a foothill of Everest. Comfort Everest or luxury Everest trek is same and represents as an Everest view luxury trek. As comparing to Everest base camp trek route Everest comfort trek – Everest luxury trek is relatively comfortable. Guest houses are serving top quality service with modern bedrooms and western toilet facilities. Moreover, the Luxury Everest trek is the best choice for luxury travellers who want to discover Khumbu Himalayan panorama within a short span of time staying within a top luxury accommodation. Furthermore, you can see an excellent view of tallest mount Everest, Lhotse, Nuptse, Amadablam in Everest range. And hundreds of other snow-cover Mountains within 360 deg angle from Syangeboche hill station. The Syangeboche hill is the highest point you reach on this trek to get a glimpse of the Mount Everest and more mountains in a row. Besides that, comfort Everest trek introduce with mountain Sherpa villages and their typical Buddhism culture. In addition, luxury Everest trek activities happen into the Sagarmatha National Park, list under UNESCO world heritage sites. Sherpa people are living in the Mount Everest region. The Everest region is stunningly beautiful but cold and a trek to Syangeboche choosing luxury trek is just awesome. Everest Base Camp luxury-comfort trek is well worth the effort at least once in this lifetime. Throughout this journey, we utilize superior comfort guest houses along the trek route serving with super delicious meals. Thus, it is best for all age travelers who want to experience Mt.Everest and it’s surrounding’s tallest Mountains with hiking in just 12,590 feet. You can walk at your own pace, with plenty of stops for taking photographs. Everest luxury trek is possible to do in anytime throughout the year. Comfort Everest trek is equally Everest luxury trek has a short itinerary comparing to most walks in Mount Everest region leading up to the Syangeboche hill station. Comfort Everest treks tour particular route is designing for the world traveler who wishes to Everest hike in the spectacular mountain traveling within a luxury-comfort style. Upon arrival in Kathmandu, Tribhuwan International Airport, we will receive you with private vehicle and transfer to hotel Moonlight, Thamel with breakfast plan. Moonlight is a boutique style hotel locating in peaceful area in Kathmandu. Our representative will give you Everest Comfort-luxury trek information. Day 2World heritage site of Kathmandu valley sightseeing, 7 hours. Start the tour with professional tourist guide “Ammar Raj Guni” to cultural world heritage sites in Kathmandu valley. Tour includes Hindu pilgrimage sites visiting Pashupatinath temple, kathmandu durbar square and Buddhist pilgrimage sites such as Bouddhanath Stupa. Meet the evening pre-trip discussion with trekking staff for your adventure luxury everest trip. We take early morning Everest view mountain flight from Kathmandu to Lukla. Landing at Lukla airport, we start our day tour to Phakding village. We trek following a gentle climb up the mountainside of Dudh Koshi. Furthermore, Nupla is just next to you on the opposite bank. Passing several tiny villages, we reach Phakding. The trail goes straight forward through Koshi riverbanks to reach Monjo village, check into Sagarmatha National Park office. Clearing the park permit, walk to cross Hillary bridge to steep ascent to Namche Bazaar. On the way, we have an excellent view of Mount Everest (8,848m) and Lhotse (8,516m.). Namche Bazaar is locating at an altitude in 11,249 feet, a central hub for selling food and gears. We start climbing roughly 1 hour to get Sygboche airport (12,394 feet). Slowly ascent to the Syangeboche ridge of Khunde passing numerous chorten and hill station. Moreover, walk to the hilltop station for an excellent view of Mount Everest, Ama Dablam, Thamserku, Nuptse, Lhotse & other snowy mountains in 360 deg angle. Walk to Khumjung village which is the largest village in Khumbu, at the foothill of the holy mountain Khumbila. We can also visit Khhumjung monastery. It is a small settlement of Sherpa community. Today we return to Namche Bazaar with the same way and then descend down hill walking to Hillary bridge. We cross the river and follow it to Jorsale, then on to Monjo where we stay overnight in hotel with comfort accommodation. We trek to Lukla with the same trail like we use on ascend. It is the last day of our trekking. Guide go to reconfirm the return flight from lukla to kathmandu for next morning. Day 8 Scenic Mountain flight from Lukla to Kathmandu. We board our early flight from Lukla to Kathmandu airport. Upon arrival at Tribhuwan International Airport, we pick you up and drive transfer to hotel Moonlight Pankajol, Thamel Kathmandu. In the afternoon, go for shopping or request us to book tour guide for kathmandu city tour on additional cost. Drop you in Kathmandu International Airport onward your final destination. Wish you the safe and pleasent fly back to home. luxury treks everest finish. How much does Everest comfort trek cost? Hike to Everest luxury is available on USD 1,025 per person on double occupancy basis. We serve 3-star Ac Deluxe accommodation at hotel Moonlight boutique room with breakfast plan and just attach bathroom (comfort clean accommodation inside the toilet) along the trek routes. But the trip price will vary according to group size and season/month you are coming. Furthermore, if you wish to have a super deluxe hotel accommodation with staying in Yeti Mountain Home Lodges, the cost for each person will rise to USD 1,825 with minimum 2 person traveling together on a twin sharing basis. AND WE ARE OPEN TO CUSTOMIZE YOUR TOUR AND PACKAGES PRICE AS PER YOUR REQUIREMENTS. International tour leaders are highly encouraged to get discount and attractive complimentary. Kathmandu international airport transfer private vehicles. 3 nights in Twin sharing Moonlight, AC deluxe accommodation with Breakfast Plan in Kathmandu. All land transfer by Private vehicle according to programs. 5 nights in Twin sharing comfort lodge accommodation (room with attach toilet fascilities) while on trek. Require number of porters during the trek. (one porter = two guest basis) because our porter can carry maximum 25 kg of your bag pack. Well paid salary, food, accommodation and insurances of Nepalese staffs. Sagarmatha National Park entries permits and TIMS permits and as well as their fees. We can organize private Everest comfort trek / Luxury Everest Trek or Everest comfort trek starting at any date that works for you. Please contact us for more information. Answer: Yes sure !! If you provide us your flight details then you should do request then our representative will come to pick up you on Kathmandu international airport. Question: Do I need experience for Everest comfort trek? Answer: It is suitable for keen trekkers/walkers who are able to walk around 4 or 5 hours in a day, with a lightweight daypack. For this trekking – better to have experience in high altitude – somehow about 2000 meter above sea level. 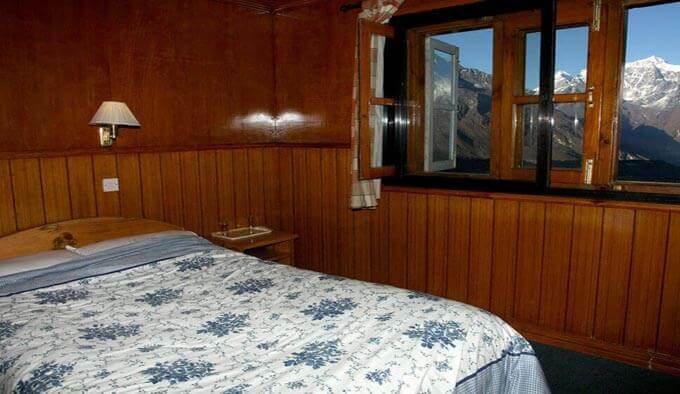 Question: What kind of accommodation can I expect on Everest comfort trek? Answer: We provide you with luxury accommodation in Kathmandu as describe in the itinerary. Likewise, on the trek, you will have comfortable accommodation with attached toilets (comfort plan on USD 1,025) or Yeti Mountain Home luxury accommodation with modern toilets facilities basis (on super deluxe plan cost USD USD 1,825). However we recommend you to take your own sleeping bags if you have one with you otherwise, you may rent it while you are in Kathmandu. Question: What kind of food can I expect in Everest Comfort trek? Answer: As you are staying overnight in Luxury hotel, you will have delicious breakfast and dinner at the hotel, however, you will have lunch on the way and you will have meal menu to choose what you want to have. Question: What opportunities will I have for a hot shower along Everest comfort trek? Answer: All those luxury hotels offer you hot shower but sometimes you have to pay roughly USD 4 for each person for each shower. Question: How do I get drinking water on Everest luxury trek? Answer: Most of all places you can find hotel and shops where you can buy mineral water and you can buy it for drinking but however we advise against buying mineral water in plastic bottles, as currently there are no provisions for disposing of these. Question: Can I charge my digital camera or other batteries on my Everest comfort treks? Answer: Yes ! at the hotel, you can charge your battery. Question: What should my insurance policy cover during Everest trek? Answer: Travel insurance is mandatory before joining any trips with us, and get your travel insurance policy before joining your trips to Nepal. Your travel insurance must cover the helicopter rescue up to 6000m altitude. It comes in handy during medical emergencies and contingency situations. It is recommended to get it from your home country. In case you haven’t bought travel insurance after arriving at Kathmandu; we can help you get one. Question: How to prevent altitude sickness during Everest luxury tours? Answer: You should never walk too quickly too high ignoring your body symptoms. Proper altitude acclimatization is the best way to prevent high-altitude sickness. Listen to your body, trek gradually enjoying the best of culture and nature while giving enough time for your body to adapt to the changing atmosphere. Drink a lot of fluid & keep your body hydrated. If symptoms like a headache, difficulty in breathing and other occurs then descend to the lower altitude and taken to the hospital. If the condition gets worse, you have to take a helicopter to fly out to Kathmandu. Question: What will happen if my schedule flight in Ktm-Lukla-Ktm route gets delay or cancel? Answer: Weather at the Himalayas is uncertain which we cannot predict. Therefore, a rate of fight delay and cancellation is a high chance at Lukla. If this happens, you can take a flight on the next day. You have to spend an extra night at Lukla (if you are returning Ktm) at Ktm (if you are going Lukla). So, we recommend you to allocate a couple of extra days after your Everest trek, so that you will not miss your international flight back. Question: What are alternates to Kathmandu to Lukla flight? Answer: The best way to go for any Everest trek is to board a Kathmandu-Lukla 33 minutes scenic mountain flight. Another available option is to drive from Kathmandu to Phaplu (12 hours’ drive) and trek for 2 days to reach Lukla. Thus, in the present day, there is also a regular jeep service from Kathmandu to Salleri. Question: Is there any communication facilities on Comfort Everest trekking? Answer: Yes! You can get telephone services and as well as internet services. Answer: Yes! But for trekking routes, you need to have cash Nepali rupees just to maintain your extra expenses because credit cards work only in the bigger city areas. And regarding the deposit, we prefer 20% advance deposit of the total package price of the trip in order to confirm your reservation before you arrive in Nepal. And the rest of the payment can be made after your arrival in Kathmandu. Question: Who will carry my luggage on Luxury Everest Trek or Everest comfort trek? Answer: We provide porters to transfer your luggage. As we are a responsible trekking tour operator agency, our every porter carry maximum 25 kilos of your backpack which means 2 guests (12.5 kg luggage of each guest): 1 porter basis. Answer: When walking/trekking in the mountains, the distance you cover each day can vary greatly due to a gradient, terrain, and altitude. As such it is very hard to give specific distances on each day, however, you have to prepare to walk roughly about 4 hours each day. Question: Do I need walking polls for Everest comfort trek? Answer: Walking pools are not compulsory but better to have. Answer: You can allocate US$ 10 – 12 for a lunch/dinner in Kathmandu and it depends on your spending habits. US$ 8 to 10 US$ each day almost enough to buy bottles of water, chocolates, tea coffee, and some drinks while you are on trek. Tallest Mountains Mt Everest, Lhotse, Nuptse, Amadablam, Thamserku view…. etc within 360 deg angle. Himalayan Sherpa Buddhism, tallest monastery, Local sherpa and their life styles. Everest comfort trek notice for Mount Everest visitor! As the information describes above the trip customizable at your request to accommodate your specific requirements. Local politics, landslides, flight cancellation, weather, transport or other factors that are out our control can result in a change of itinerary while on a trip. It is, however, very unlikely that the itinerary would be substantially altered. If alterations are necessary the leader will decide the best alternative option, taking into consideration the best interests of the whole group. Where a change does occur, we do everything we can to minimize its effect, but we cannot be responsible for the results of changes or delays. Opportunities for challenging trekking pleasant strolls are scattered all over this planet; you just need to know where to find them. We at Gokyo Treks Nepal believe in the quality services. Your safety and satisfaction is our concern. We are a team of professional local guides who know the destination better than others. Moreover, we give benefits to the local communities and help to conserve natural resources which reduce costs and consumption. I booked the Trek with Gokyo Treks and Expeditions and from the initial inquiry to the end of the trip the company was very impressive. Ammar Guni, director of company was extremely efficient and answered e mails and messages by return. I was extremely fortunate to have Bhupal as the Guide and Milan as my porter. They were both extremely kind and always wanted to ensure I was safe and happy. The trek was amazing and I would definitely recommend and use this company again for trekking in Nepal there customer service is excellent. – < Alison Shutt, London, United Kingdom.